Matt discusses what he's been recently working on at the bequest of the audience. >> Speaker 1: What are you working on now? >> Mathew DesLauriers: So now other than this workshop which I've been working on, I just finished a little project, it was quite small. >> Mathew DesLauriers: I don't know if I can show it on this screen with us feeding into the live stuff, but it's basically actually just a cursor effect kind of on a website. [00:00:26] They've wanted it to be when you visit the website, they have this really pronounced sort of paint-splashing effect as you move around the website. So it's very much like a classic WebGL, using WebGL to enhance a website. It's a very small project. Before that one, I was working on one that was a print design campaign for Nordic Impact, if I can just find it within all of my folders here. >> Mathew DesLauriers: Where's all the outputs? >> Mathew DesLauriers: Yeah, just go to the website. You can check out the website yourself actually. It's like the project is open, and the ideas that for this music festival called Nordic Impact in France, you would create a little poster using some different music or different parametrics or functions. 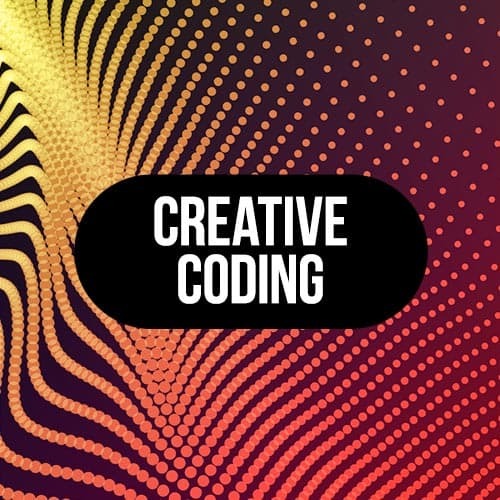 [00:01:45] And this was a collaboration with a design studio in Paris who really worked on sort of the design and the overall aesthetic, as well as working with another creative coder who really worked on the background. And then this part I was a bit of the sort of WebGL aspect, the 3D WebGL aspect. [00:02:03] As you can see is using a lot of the same concepts we talked about. Probably it looks better on your own MacBook or your own screens, your own Windows or whatever computer than this projector, but it's basically just tweaking the values, allows the user to create their own sort of poster. [00:02:19] And then they end up with an image, and the image is large enough that they can print it. And actually this whole project is using Canvas sketch as well. So it was kind of another test of using, whoops. >> Mathew DesLauriers: It was another test of using Canvas sketch for a client work, and it turned out really well. [00:02:42] And there's this Hall of Fame, where you can see all the people who have generated posters before you. And so you can just share the poster online. And it's just to get people to get excited about the music festival that was coming up. Yeah, just like a general design sort of project using WebGL. >> Mathew DesLauriers: Is this one, and I think it sort of shows another side of creative coding that I didn't know before is using hardware and using Raspberry Pi and stuff like that to create an interactive installation. [00:03:30] And so the idea is that it's this cold, wintry day in a park, and you stumble on this sort of warming, hot-looking-like thing. You step up to it, and when you step up to it it captures your body heat, and it turns red in response to your heat. [00:03:43] And it's using a thermal camera, and inside it's using a few LED screens with a frosted painted glass. And it's actually, you can't really tell by the inside but it's using a noise function to create this undulating pattern of different colors. So it's basically all the same stuff we were talking about today. [00:04:04] I'm just using it in LED screens, and then putting a pane of frosted glass in front of it to create that nice, blurry effect. And that was a really fun project. But yeah, same kind of concepts, noise functions, and seeing creative coding ideas, but applying it in a different space. [00:04:24] Thanks a lot everyone, that was a lot of fun.